Ok, so baking cakes isn’t anything new, but for this pregnant, swollen, tired to-be-momma, it was a feat! Especially when I attempted a brand new recipe that had been circulating on Facebook, and it ended up being a 3 hour process!! 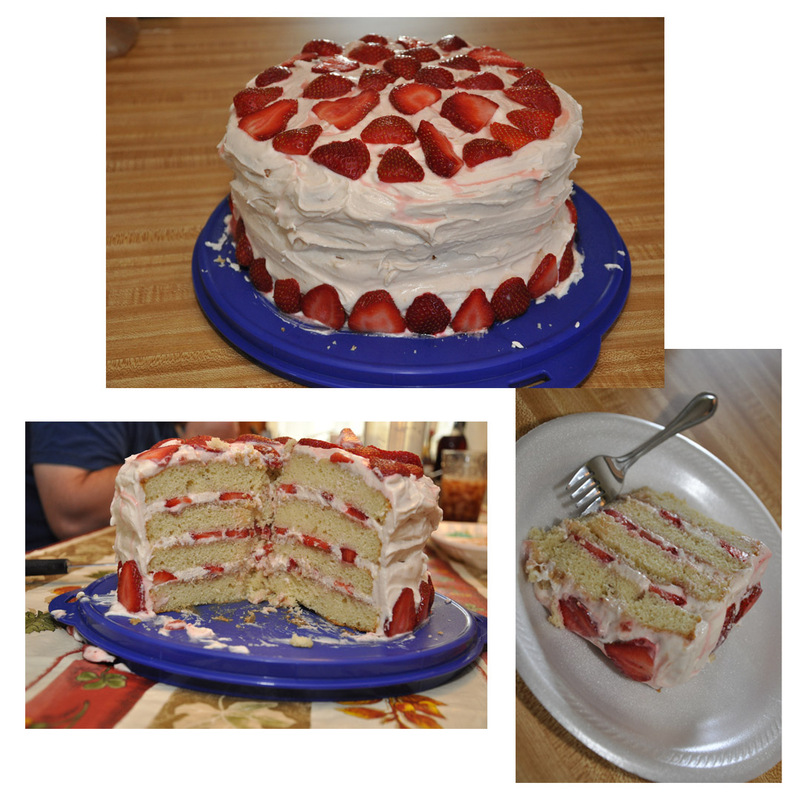 I was drawn to the recipe because it used fresh strawberries, and it is strawberry season here in North Florida, and I love strawberries, and I hadn’t had any shortcake in awhile. This cake looked like it would satisfy for Easter dessert and have yummy berries. On closer reading, as I was making the cake, I realized the cake also ended up with 7 eggs, 4 sticks of butter, 2 packs of cream cheese, 7 cups of sugar (YES, 7!!!!) and a bunch of other ingredients. I would estimate the cake cost me about $12-$15 to make, partly because I had to re-stock my pantry with baking powder and baking soda, as well as cake flour ($5 right there). But, was it worth it? ABSOLUTELY! It was a huge hit at my family dinner, and my husband says I now need to promise to make it every year. He even made me pinky promise, although I don’t think any commitments made while pregnant are legally binding. Or at least they shouldn’t be – I live in a state of duress. And here was the finished product, I swear about 10 pounds of yumminess! Since the baby still doesn’t like for me to eat a lot of sugar, I held back and only had a small slice at lunch, but everyone else had some for lunch and again after dinner! I think we polished almost half of it off today!! I did read on the original post in the comments, that you should eat the cake within about 3 days since the fresh berries just don’t hold up real well. I think its obvious too, but keep it in the fridge since the frosting is cream cheese based. I ended up making the icing and baking the cake one night, and then assembling the cake the next day. I recommend this if you have time since the cake was completely cooled and sliced in half easily. The icing was also firm from being refrigerated overnight and went on really easy without picking up crumbs. That cake looks sooooo yummy!